Neighbors have said they're repeatedly disturbed by late-night noise in student-rented townhouses, like one near 24th and I streets. Updated: Sept. 9 at 7:17 p.m. The University has rolled back its plans to monitor students’ off-campus residences after intense lobbying by Student Association and Greek life leaders – a reversal that both groups have claimed as a win. Dean of Student Affairs Peter Konwerski said in an interview that students living off campus will not be required to register their addresses or attend workshops about good-neighbor practices this fall or face penalties. Students will still be asked to input their addresses with the Office of the Registrar, as they have in past years, Konwerski said. That’s an about-face from this summer, when Konwerski told a roomful of Foggy Bottom neighbors that GW would begin requiring students, starting with members of Greek life, to provide their off-campus addresses this fall or face a hold on their account. He also said then that students living off-campus would have to participate in online or in-person workshops about good neighbor relations or face an academic hold. Konwerski had said in July that GW would pilot the policies this fall and that he planned to field student feedback, but the timeline for implementing the policies is now undecided. University spokesman Dave Andrews also maintained that the University had planned run the plans past students. “From the very beginning, GW has continually sought to gather student feedback on this matter until a consensus could be made that was reasonable and justified,” Andrews said. Student Association President Julia Susuni said she started to actively lobby GW administrators after receiving “a ton” of phone calls and emails from students who were concerned by the policy changes this summer. Susuni and SA Executive Vice President Kostas Skordalos both met with Konwerski and Associate Dean of Students Tim Miller this summer to pitch ways that the policy could be more fair to the students, particularly in Greek life, they said. Greek life members took issue with administrators’ plans to collect members’ addresses before the general GW community. Outraged students started a petition that had collected 1,140 signatures as of Sept. 8. Greek leaders also began meeting with Konwerski and Miller the first week of classes. Miller said Greek life leaders were not initially opposed to the plan because it just would have added a question about student addresses to the annual forms all Greek members must complete. Miller said Greek leaders calmed down after meeting with him last week after the outcry he saw this summer. But neighbors, who helped push the policies in the first place, said they still wanted to see GW move forward with the plan. John Kurutz, a resident at the Jefferson House on 24th Street, said at the neighborhood meeting this week that one of his neighbors had not slept in three days because of excessive partying. “He had to go into the emergency room because of the sleep deprivation and they had to resuscitate him,” he said. 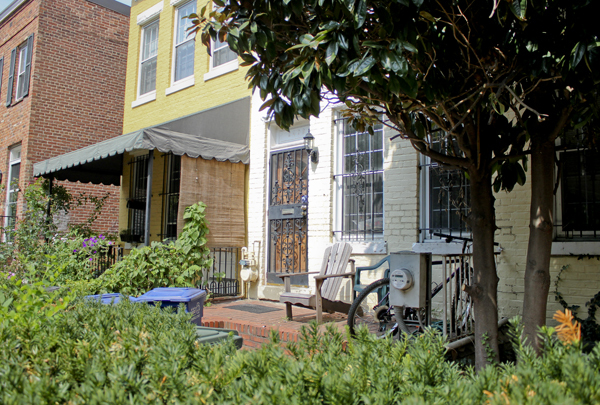 Tensions with Foggy Bottom neighbors hit a boiling point last year, pushing residents to organize and lobby GW’s top officials to stop late-night parties and leftover trash on sidewalks. The University has made strides to address neighbor complaints this year, announcing officials would launch an online complaint form to report troubled townhouses. GW is also pushing a city bill to give the University Police Department jurisdiction outside campus lines to help break up noisy parties. Additionally, Director of Community Relations Brittany Waddell said members of her office reached out to students in “certain townhouses” to talk about “how to be a good neighbor” and inform them on city regulations, like D.C.’s quiet hours which start at 10 p.m. during the first week of classes. The Hatchet misreported that University officials announced a change in policy at a neighbor meeting this week. That meeting did not include any announcements from GW officials. This article appeared in the September 9, 2013 issue of the Hatchet.